A House committee hearing concerning Johnson & Johnson's (JNJ) recall of children's medicine -- the largest in the history of the U.S. Food and Drug Administration -- began Thursday morning. 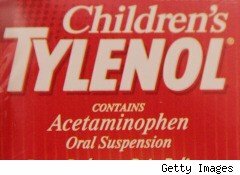 Last month, McNeil recalled over 40 varieties of over-the-counter medicines, such as Children's Tylenol and Infants' Tylenol, which are estimated to represent 70% of the market. Ed Towns, chairman of the Committee on Oversight and Government Reform, said the recall was "troubling" and questioned the health risks posed by these products. He also revealed internal documents containing, among other information, a previously undisclosed cover up of a Motrin products recall, shedding a highly unfavorable light on J&J and its McNeil Consumer Healthcare unit. Towns vowed, in the questioning of a J&J executive and FDA officials, to "follow this road until we have all the answers the American people deserve." Documents obtained by DailyFinance ahead of the hearing show lawmakers are concerned about the way J&J and the FDA handled the move and events leading up to it. Finding foreign particles in the children's medicine and three batches of Infant's Tylenol that were "super potent" are worrying enough, but it seems the Committee has even more damning evidence to present at the hearing. The Committee will want to hear explanations about the actual health risks the recalled products posed. So far, the FDA has found no links between the recalled medicines and adverse health effects, but it's investigating any possible such links, including a few reports of children's deaths. One document the Committee received from the FDA discusses the death of a 1½ year-old girl "that is suspected to be related to a Tylenol product." The Committee will also want to know why McNeil tried to cover up a recall of Motrin products in 2008. Documents obtained by the Committee Wednesday night show that "McNeil knew there was a potential problem with one of its Motrin products that was on the market in 2008, but rather than issue a public recall, McNeil allegedly sent contractors out to stores to buy the product back and told the stores "not to mention" a recall." It only issued a recall after being confronted by the FDA. Towns calls this "phantom recall" a "scheme," wondering how far up the management the plan's decision-making went and whether this was standard practice. The Committee promises to "use all of our authority to find out what went wrong [with the recall] and do everything we can to ensure that it doesn't happen again." Colleen A. Goggins, worldwide chairman of J&J's Consumer Group will be the one that has to answer the Committee's questions as J&J CEO Weldon couldn't appear due to back surgery. In a prepared statement, she says, "The quality and process issues that we found at McNeil, those which led to the recall and others, are unacceptable. On behalf of McNeil and Johnson & Johnson, I apologize to the mothers, fathers, and caregivers for the concern and inconvenience caused by the recall." Goggins goes on to explain that the health risk to the consumer from the recalled product is remote, calling the recall precautionary. She touts how "McNeil acted quickly and decisively" to recall the products and alert the public. Finally, she details the steps McNeil is taking to raise quality back to the level "that Johnson & Johnson demands of its companies." What this testimony completely lacks is any kind of reference to problems at the drugmaker that began well before the latest recall and have been ongoing for nearly two years. They sparked unsatisfactory inspections by the FDA and other recalls. The testimony also doesn't address many of the FDA's allegations that McNeil failed to report problems on time, delayed investigations into quality problems and completed the probes prematurely. It will be interesting to hear Goggins response to the 2008 Motrin "phantom recall." Dr. Joshua M. Sharfstein, the FDA's principal deputy commissioner, will also have to face tough questions. While he will shift most of the blame to J&J, telling the committee how "over the last few years, FDA has had growing concerns about the quality of [McNeil's] manufacturing process," it won't answer why the regulatory authority didn't act more decisively sooner. Ongoing unsatisfactory inspections and recalls and the FDA's "extraordinary step" of meeting with management of McNeil's parent company, J&J, show there was considerable concern at the agency -- but perhaps not enough action. The FDA concluded that the "risk posed to the public by these problems was remote." Sharfstein adds that the FDA is now "closely monitoring the implementation of a corrective action plan developed by McNeil." The agency is also considering additional enforcement actions against the company for its pattern of non-compliance, and this may include seizure, injunction, or criminal penalties. For a round-up of what happened at the hearing, see "J&J Drug Recall Hearings: Contradictory Accounts and Cover-Ups"